A story collection are set in a Swedish village on the Baltic Sea as well as in Stockholm over the course of two eventful years. ...[an] intricate, riveting story collection ... Beach’s characters are governed by violent forces, yet their inner lives are textured by tender questions about self-judgment, regret, and finding grace in a landscape that is at once bleak and beautiful ... In the tradition of Breece D’J Pancake, Alan Heathcock, and Kyle Minor, Beach employs deliberate, achingly spare language to delve into the darker corners of human experience. The resulting atmospheric tension is as much a testament to Beach’s talent as it is effectively unnerving. It is difficult to guess how these stories end or to classify them as funny or sad, uplifting or depressing, smart or silly, etc. The truth is that each of these stories is all of those things and much more ... The way that Beach has used his remarkable, clear voice to fully render weather and architecture and nature, has made it at once invisible and yet so striking. Reprising an ensemble of characters back and forth in time, these linked stories enter us, dreamlike yet unnervingly real, sometimes close to sublime for their deep, fierce insights. 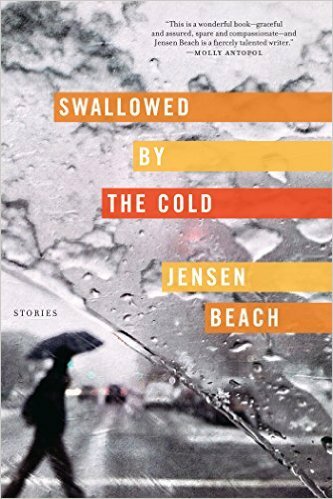 Swallowed by the Cold is dark, seductive and worth finding. What did you think of Swallowed by the Cold?